Operating an institution of higher learning includes many challenges – dependence on tuition, fluctuating endowment values, financial sustainability, and aging faculty to name a few. We understand the unique needs of institutions of higher learning and the importance of maintaining accurate and reliable financial and compliance records. This is also true with respect to maintenance of your institution’s accreditation. Our firm takes pride in maintaining continuous awareness of current legislation and industry changes that affect your institution. By working with Frazer you will receive hands-on, cost effective, tailored solutions based on your needs from a dedicated higher education practice staffed with qualified and experienced personnel. 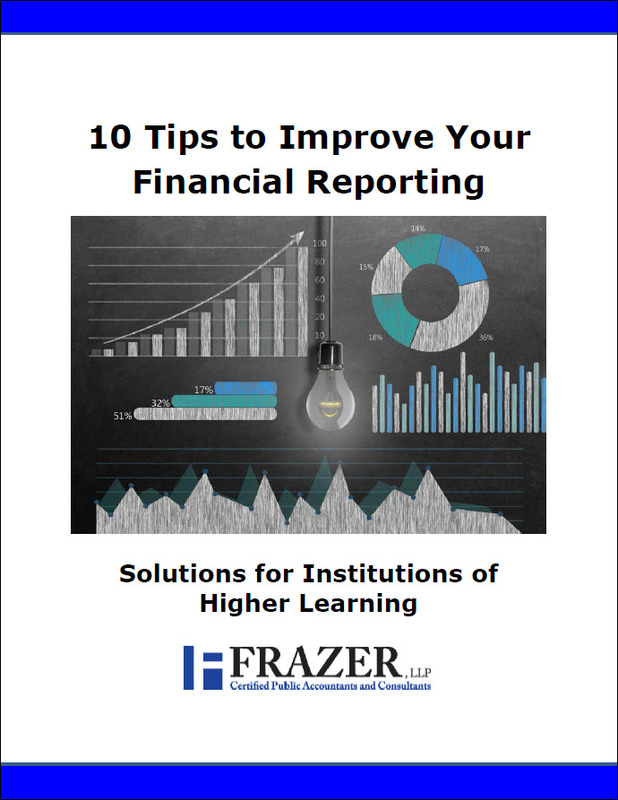 If your primary focus is institutions of higher learning contact Frazer LLP: With You. For You. One of the top 10 audit findings is inaccurate or untimely reporting of NSLDS rosters. Less than satisfactory reporting can have a negative impact on students’ records and details related to their financial aid status and history. One of the top 10 audit findings is R2T4 (return of Title IV funds) calculation errors. From a technical standpoint, regulations require that Title IV financial aid allocated for a student who later withdraws should be returned. Credit balances can occur in many ways and may be the result of payments from not only Title IV program funds, but also personal funds, private loans, and institutional grants. Also, as you are aware, credit balances may be related to and affected by changes in a student’s enrollment status that might affect federal or other aid eligibility. Whether first-time borrowers, withdrawn students or graduating students, follow through on required entrance and exit counseling can be challenging. Exit counseling, however, becomes a little more challenging considering the circumstances and variables involved with the ways students exit.